These aligners are removable, and are created with state-of-the-art 3-D computer imaging, customized for each patient’s unique needs. This makes them incredibly comfortable and easy to wear. In total, patients receive 12-48 Invisalign aligners, depending on their treatment needs and goals. Patients simply take their aligners home, and wear each one for about two weeks. We recommend patients wear their aligners for about 22 hours a day. With Invisalign, you can watch your smile transform right before your eyes! This is VERY different from traditional braces, which need to be tightened on a regular basis in order for the straightening to occur. With Invisalign, the aligners gradually straighten teeth. In fact, it’s so gentle, that patients don’t notice any discomfort or pain. What they do notice, however, is the results! Also it’s worth noting that, unlike braces, Invisalign does more than just “move teeth.” It also controls when teeth are moved. That’s because each aligner tray is crafted in a slightly different way. At different points in the treatment, different teeth will be moving – compared to braces, where there’s no way to isolate a tooth or a set of teeth. With braces, if one tooth moves, they all move! 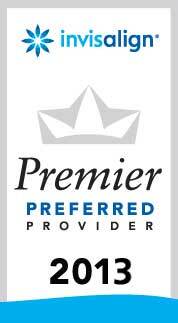 When it’s time for new aligners, patients simply pick them up from our practice and continue with their treatment. 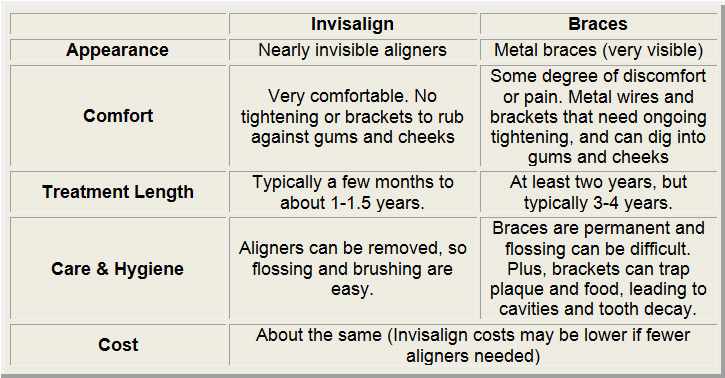 As mentioned, patients typically require between 12-48 aligners in total, depending on their unique treatment needs. The average time that patients wear their complete set of aligners is about one year, but many patients finish their “magic” treatment in six months or even sooner. Compare that to SEVERAL YEARS with metal braces! As you can see, the Invisalign vs. braces debate is hardly a fair fight – it’s Invisalign all the way! Over the years, our Invisalign patients have asked us some great questions – the kind that you probably have right now. To help you get the answers you need, we’ve prepared an “Invisalign Frequently Asked Questions” section, and it’s the next stop on our tour. Click here.